Dental implants are designed to look like your natural teeth and are built with a strong foundation. These devices are made from titanium. There are many benefits to having these devices in your teeth. These benefits include improving your appearance by using these titanium devices that look as well as providing you with a set of natural looking teeth. These teeth inserts fuse together with the bone so they can become permanent. It can also help make your speech better. If you require dentures and they are made incorrectly, it can cause you to mumble your words. But with these inserts, you can speak clearly. 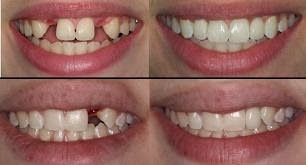 For people with missing teeth, having a teeth implant can mean the difference between having a confident smile or one that is hidden from the world. Not only will they allow a person to be confident in their smile, but they will once again be able to chew their food in the replacement area. This, along with general gum health improvements, provides an unmatched benefit of having dental implants done.